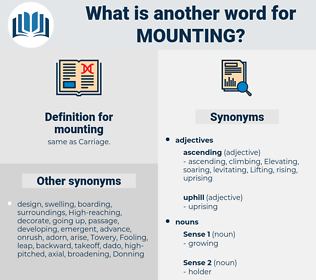 What is another word for mounting? ever-increasing, ever-growing, spiraling, Heightened, hold-down, escalating, escalated, Fitted, tie-down. Amounting, implementing, operationalizing, augmenting, documenting, undertaking, confrontations, unfolding, conducting, Mobilizing, Accumulating, compounding, Accentuating, commissioning, Commenced, Commencing, mushrooming, organisation, continuing, deteriorating, Initiating, determining, organization, Formulating, climbing, organising, launching, Instituting, burgeoning, Organizing, reassembling, recosting, topping, Establishing, heightening, exacerbating, intensifying, Configuring, overheating, redoubling, worsening, reinstalling, convening, ascending, improving, escalate, broadening, performing, running, arranging, Enlarging, trimming, adjust, Adjusting, sponsoring, tuning, regulating, Embarking, emerging, identifying, Pertaining, becoming, recording, Boosting, deepening, advancing, resurging, emphasizing, matting, billowing, Throwing, Clamping, Adopting, Accruing, pending, staging, snapping, simmering, standing, Hosting, Attempting, settling, demanding, swelling, exercising, putting, Gaining, framework, joining, defining, exceeding, boarding, starting, Staking, Arising, Waged, Waging, scaling, agreeing, targeting, Stepping, offering, Levying, creeping, going, seeking, wrapping, Carrying, loading, Respecting, forging, shaping, Relating, filling, feeling, spreading, Adding, playing, trying, taking, backing, dealing, Doing, getting, escalating. multiply, Multiplying, erecting, Attaching, riding, spiraling, escalation. slump, dismount, Unfix, fall, drop, subside, alight, decrease, decline. A rider was mounting out there for some reason. The boy himself came around the house just as Mary was mounting her horse to ride away. meadow mouse, muteness, mountain ash, metonymic, mending, meeting, medium-size, moodiness, monoatomic, mating, matins, madness, mediateness, mutinus, mountain oak, maddening, muddiness, monatomic, myotonic, meat-eating, mandamus, mundaneness, meeting house, meetinghouse, minuteness, Mount Adams, matting, mountainous, maintenance, Montan Wax, monotonous, momentaneous, monotonic, muntingia, mutinous. mat, matting, mount, passe-partout, chassis, setting.